4/28/2019 • 4pm	The Symphonic Double Bass Quartet is looking forward to performing at the Princeton ArtsFest Communiversity 2019! Come check out this ensemble, coached by Artistic Director, John Enz, at 4pm on the Palmer Square Stage! See you there! 5/11/2019 We regret to inform you that the YOCJ Board of Trustees had to cancel the Hershey Park trip due to low numbers. All payments will be returned as follows: Tues. April 9, 7pm to 7:30pm at the information table Tues. April 16, 6:30 to 7:30pm at the information table Thanks for your understanding! 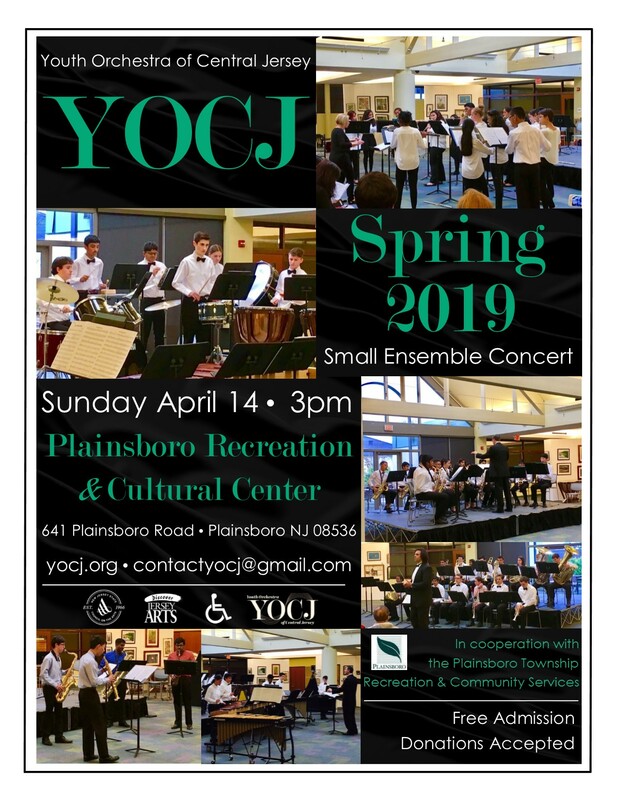 Come join us at the Plainsboro Recreation and Cultural Center for the Spring Small Ensembles Concert, on Sunday April 14, 2019 at 3pm. This performance features our “choirs” such as the Flute Ensemble, Woodwind Choir, Woodwind Chamber Players, Brass Choir, Brass Ensemble, Saxophone Ensemble, Saxophone Quartet, and Percussion Ensemble. These small ensembles are an integral part of the Youth Orchestra of Central Jersey! Copyright 2019, Youth Orchestra of Central Jersey. All Rights Reserved. Website by Asenka.